Cuirfidh Conair Eacnamaíochta an Atlantaigh (AEC) forbairt shuntasach réigiúnach chun cinn, a chomhlánóidh agus a chothromóidh Cósta Thoir na hÉireann atá faoi bhláth. Tugtar AEC ar an réigiún neamhriaracháin nó “líneach” ar bhord farraige an Iarthair, ó Chiarraí go Dún na nGall. Is é an aidhm atá leis seo ná comhoibriú a chruthú agus a mhéadú laistigh den AEC, comhoibriú a uasmhéadaíonn sócmhainní, a mheallann infheistíocht agus a cIs í an Roinn Forbartha Tuaithe agus Pobail atá ag cabhrú leis an tionscadal a chur chun cinn agus le plean soiléir a fhorbairt le go mbainfear cuspóirí AEC amach. Is é an tAire Stáit Seán Canney atá ina chathaoirleach ar thascfhórsa AEC. Officers are based in each of the ten AEC local authorities. The officers are the main point of contact for the AEC project in their respective counties and their details are found below. The AEC Officers and sub-committees are supported in their work by Pauline Leonard paulineleonard@wdc.ie of the Western Development Commission. Cuireann tionscnamh Chonair Eacnamaíochta an Atlantaigh deis ar fáil le bealach níos freagrúla a bhfuil dlús leis a chruthú d’fhorbairt réigiúnach in Éirinn. Beidh nascacht ríthábhachtach le teacht ar chumas eacnamaíochta agus sóisialta réigiún an Atlantaigh. Is éard atá i gceist leis an gcumas seo ná feabhsuithe fisiciúla a dhéanamh ar bhonneagar bóithre, iarnróid agus iompair eile agus ar an nascacht dhigiteach a bhfuil sé de chumhacht aici ceantair thuaithe a athrú ó bhonn agus a spreagadh. Caithfimid tús áite a thabhairt do nascacht 21ú haois chun tacú le cleachtais nua-aimseartha ghnó agus chun deiseanna eacnamaíochta a mhéadú i réigiún an Atlantaigh. Ar an gcuma chéanna, caithfear fóntais, lena n-áirítear gás, uisce agus fuinneamh in-athnuaite, a fhorbairt ar bhealach straitéiseach chun cumas an réigiúin a uasmhéadú. Bíonn an tábhacht atá leis an Eacnamaíocht Mhara in Éirinn ag méadú i gcónaí. Is príomhthosaíocht í an fhorbairt leanúnach atá á déanamh ar Aerfort Iarthar Éireann agus ar Aerfort na Sionainne agus ar phríomhchalafoirt na hÉireann, Faing agus Gaillimh ina measc. Is féidir na nithe seo ar fad a bhaint amach agus muid ag teacht le straitéisí reatha náisiúnta agus réigiúnacha. Sheol Rialtas na hÉireann Tionscadal Éireann 2040 i mí Feabhra 2018. Is é an creat uileghabhálach polasaí agus pleanála d’fhorbairt shóisialta, eacnamaíoch agus chultúrtha na hÉireann. Tá Creat Pleanála Náisiúnta 20 bliain agus plean infheistíocht caipitil 10 mbliana, Plean Forbartha Náisiúnta 2018-2027 i gceist leis an tionscadal seo. Forbraíodh an Creat Pleanála Náisiúnta in éineacht leis an bPlean Forbartha Náisiúnta le cur chuige comhordaithe i dtaca leis an gcaoi a n-infheistímid i mbonneagar poiblí a chinntiú ar bhealach atá ceangailte lenár dtosaíochtaí náisiúnta spásúla. Is príomhchuspóir straitéiseach de chuid an Chreata Phleanála Náisiúnta agus de chuid an Phlean Forbartha Náisiúnta forbairt eacnamaíoch a chur chun cinn ar fud na réigiún agus cur ar chumas gach ceantair sa tír barr a chumais a bhaint amach. 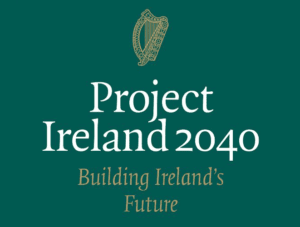 Dá bhrí sin, tacaíonn Tionscadal Éireann 2040 go mór le Conair Eacnamaíochta an Atlantaigh atá ag cabhrú lenár gcuspóirí spásúla agus eacnamaíocha a bhaint amach. Mótarbhealach M17/M18 idir Tuaim agus an Gort – a d’oscail i Meán Fómhair 2017. Feabhsaíonn an mótarbhealach seo, atá 57km ar fad, nascacht san AEC go mór. • Infheistíocht mheasta de €850 – €900 milliún a dhéanamh sa mhótarbhealach M20 idir Corcaigh agus Luimneach idir seo agus 2027. Infheistíocht mheasta de €550 – €600 milliún a dhéanamh i gCuarbhóthar na Gaillimhe idir seo agus 2025 – chun nascacht agus amanna taistil a fheabhsú i gCathair na Gaillimhe agus thart ar an gcathair. Infheistíocht shuntasach a dhéanamh sa Ghréasán Bóithre Náisiúnta sa chonair, lena n-áirítear an N4 idir Cúil Mhuine agus Béal Átha na gCarraigíní, a fheabhsóidh amanna taistil go agus ó Shligeach go mór. Infheistíocht mheasta chaipitil de €150 milliún idir seo agus 2022 atá á déanamh ag Shannon Group chun a phunann réadmhaoine a fhorbairt le réitigh ardchaighdeáin déantúsaíochta, trádstórála agus spáis oifige a chur ar fáil. Infheistíocht de €27 milliún a dhéanamh i gCalafort na Sionainne-Fhainge idir seo agus 2022, a mhéadóidh acmhainn agus rochtain ar thalamh ach an N69 a uasghrádú agus líne iarnróid Luimnigh-Fhainge a oscailt arís. Tiomantas tríd an bPlean Náisiúnta Leathanbhanda le leathanbhanda ardluais a chinntiú ar fud na tíre, AEC san áireamh. Meastar go mbeidh rochtain ag 90% d’áitribh ar fud na tíre ar sheirbhísí leathanbhanda ardluais roimh dheireadh 2020. Clár náisiúnta infheistíochta de €8.5 billiún chun seirbhísí uisce a chur ar fáil le cinntiú go bhfuil soláthar sláintiúil agus athléimneach uisce ag daoine agus ag gnólachtaí. Beidh ról lárnach ag lárionaid uirbeacha i réigiún AEC i bhforbairt eacnamaíoch na hÉireann amach anseo. Tá sé tábhachtach an tacaíocht a thugann lárionaid fáis uirbeacha do dheiseanna fostaíochta agus do chumas eacnamaíoch an réigiúin níos leithne, lena n-áirítear ceantair thuaithe, a aithint. Tacóidh láithreacht na lárionad fás réigiúnach, a bhfuil deiseanna maithe poist acu, agus go háirithe an rochtain atá ag daoine orthu leis na daoine seo a choinneáil sa réigiún agus cabhróidh siad le moill a chur ar imirce amach i gceantair thuaithe. Tá a láidreachtaí agus a shócmhainní féin ag gach contae i réigiún AEC. Áirítear leis seo sócmhainní tógtha agus nádúrtha, Institiúidí tríú leibhéal agus earnálacha iomaíocha fiontair, lena n-áirítear Gnó Agraibhia, BioPharmachem, Eolaíochtaí Beatha, an Eacnamaíocht Mhara agus Teicneolaíocht Faisnéise agus Cumarsáide. Sa 25 bliain amach romhainn agus ina dhiaidh sin, d’fhéadfaí leas a bhaint as cumas na n-acmhainní in-athnuaite fuinnimh, lena n-áirítear fuinneamh gaoithe ar an gcladach agus ón talamh, fuinneamh tonnta agus grianchumhacht. Tá réimse leathan sócmhainní turasóireachta sa réigiún agus tá an deis aige leas a bhaint as rath Shlí an Atlantaigh Fhiáin agus as a iomrá ar fud bhord farraige an Atlantaigh.